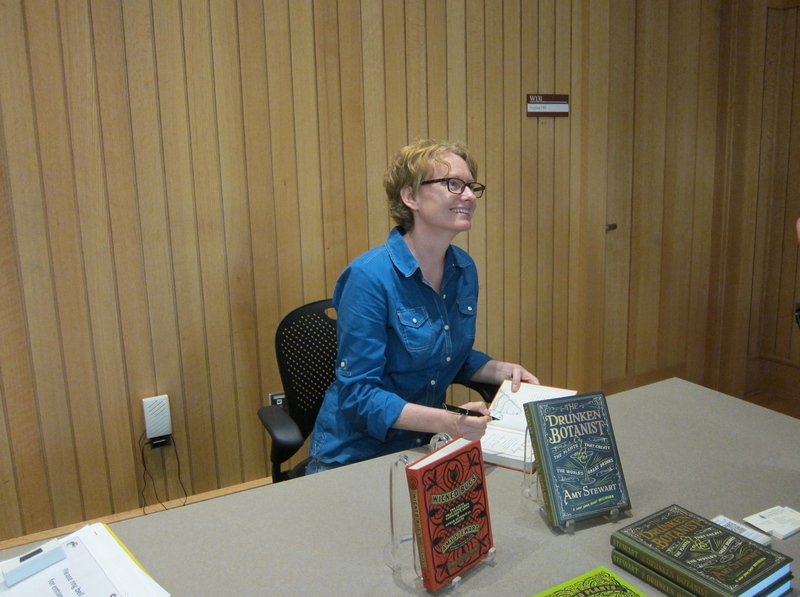 I went along to the Arnold Arboretum on Wednesday evening to hear Amy Stewart (www.amystewart.com) talk about her most recent book, The Drunken Botanist. Stewart is well known in the garden bloggingsphere. She cofounded the successful blog GardenRant (www.gardenrant.com) back in 2001, well before many of us even knew what a blog was. She also has a successful print writing career. She has published six books and has been on the New York Times best sellers list three times. I have been reading and enjoying GardenRant for years, so I was interested to see and hear her up close and personal. Stewart is an entertaining speaker. She has a lot of experience and her presentation benefits from that. It’s witty, engaging and offers up just the right amount of information to keep the audience attentive, without either boring the audience or giving away too much so no one buys the book . Nevertheless, I felt lectured. The subject of The Drunken Botanist is how alcohol comes from plants. Listening to Stewart explain this was akin to being at a dinner party where the verbose host has just discovered for herself knowledge the rest of the world has known for millennia. Trapped at the dinner table with other informed guests our host would go on about how “junipers are an important ingredient in gin, I have it on good authority from Dr X at Cornell” and “dark rum gets its color from molasses according to Dr Y who has done extensive research in Barbados “. It is enough to make one reach for the fermented grape juice again and again. The best fun fact of the evening came ad lib from the audience. Ned Friedman, director of the Arnold Arboretum (www.arboretum.harvard.edu), offered up the tidbit that hops, from which beer is made, is in the same family, Cannabaceae, as marijuana. Just goes to show there is a lot of fun to be had in the natural world, if you know how to mix it. After the talk the organizers had the good idea to ask several local distillers and brewers to offer samples of their wares, all made from – you guessed! – plants. There was watermelon beer from Blue Hills Brewery, and lots of spirits from Bully Boy Distillers and Grandten Distilling. All quite enjoyable, and potent. 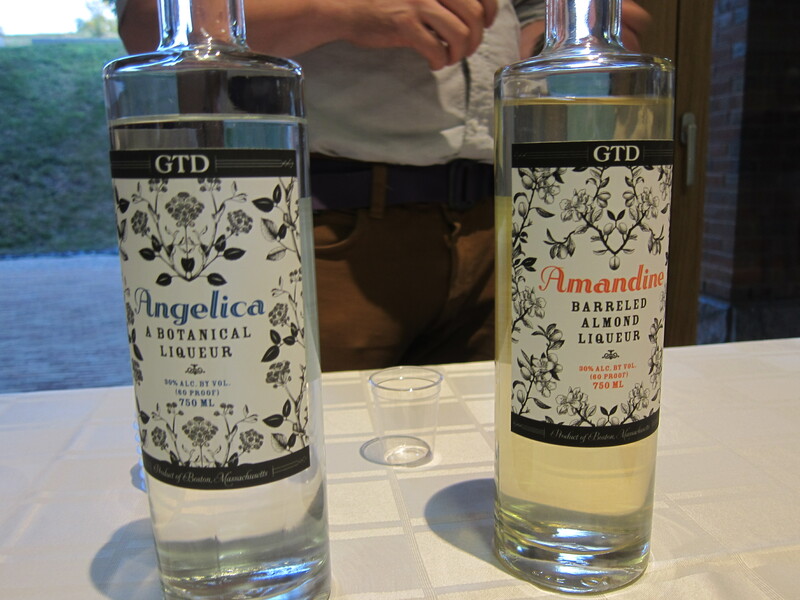 Don’t be fooled by the name, the Angelica liqueur is 60 Proof. No fading flower there. I did not buy the book. I’m spending the money on distilled plants. The tidbit about hops and Cannabaceae was quite fun to know! Ummm…very interesting what some people know and don’t know. Haha! I love the fact you went for the booze instead of the book! Well, after all isn’t that what the book is promoting?! 😉 !! I am glad you see the humor in the situation! Thanks very much for your comment.